Homeowners can now mow their lawns faster, more easily and more efficiently with John Deere's latest zero-turn radius (ZTR) mower, the Z235. This new model in the EZtrak ZTR range has been redesigned to offer a compact, easy to use machine especially for smaller or more intricately landscaped gardens. The Z235 has a forward speed of up to 10.8km/h (6.7mph), with a robust belt drive transmission that boosts ground speed. The mower’s 360-degree turning ability makes it highly manoeuvrable and reduces the number of passes required to mow the garden. The Z235 comes with a 107cm (42in) rotary deck featuring the John Deere’s patented EDGE cutting system, a design that lifts and distributes grass clippings more evenly. In addition to speed of operation, both ease of use and operator comfort are important when using a ride-on mower. The Z235’s more compact design ensures that mowing is now more convenient using this type of machine in smaller gardens and around landscape features or other obstacles. 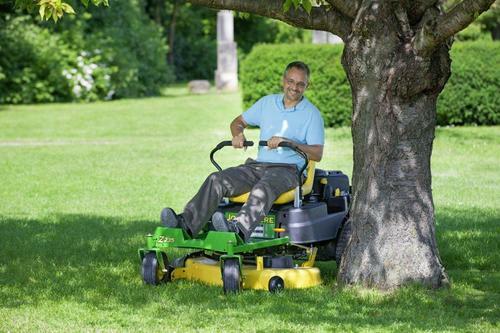 The mower’s new lower centre of gravity makes steering smoother and improves traction. Operators can also adjust the cutting height of the machine from 25 to 102mm (1 to 4in) in a matter of seconds, without getting out of the driver's seat. The operator platform also lifts easily to give the user quick access to the mower deck’s drive belt for cleaning out any build-up of grass clippings, and for faster maintenance. An optional rear collector is also available. The Z235 replaces the Z225 and joins two other John Deere zero–turn radius mowers in the EZtrak range - the Z425 for residential customers and the Z645 for semi-professional users. The new Z235 zero–turn radius mower will be available from John Deere dealers in spring 2014.